Sandler Hudson Gallery is thrilled to present the latest body of work by Brett Smith. The portrait of a landscape under construction, from the scaffold to thicket we build explores our interactions with nature via complex, layered drawings. The starting point for this work is the tension between urban expansion and the parallel struggle of the natural world to grow and flourish. These sizable drawings on panel are initially overwhelming: hints of scaffolding and construction cranes draw the viewer in, and the complexities of Smith’s process invite us to stay and create our own understanding. Smith’s work is visually sharp and direct. Using tools to cut into the painted layer of his panels, the exploration of line becomes literally nestled within the wax, oil paint and oil pastels that comprise his surfaces, which are often repainted and reworked. 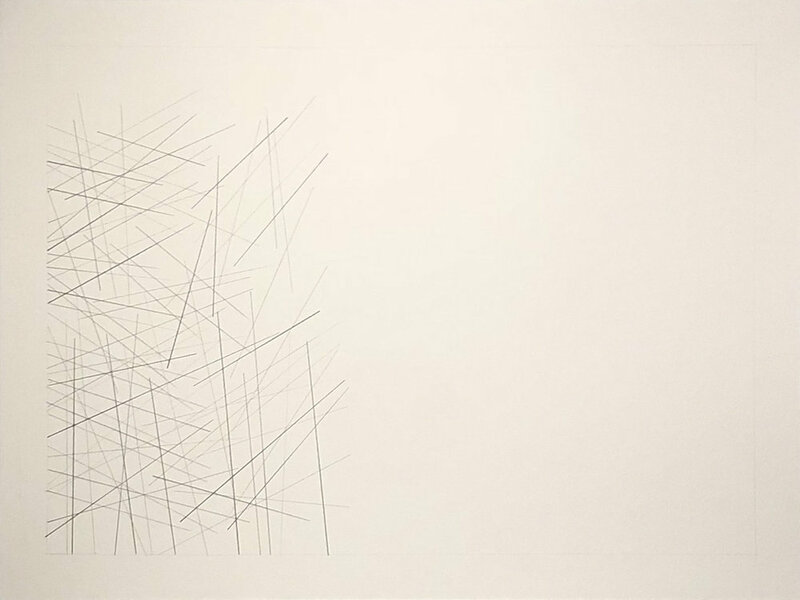 The result is an unmistakably human-made tangle of lines and intersections of varying depths and contrasts. The patterns reference blueprints, they evoke the feeling of a pedestrian surrounded by construction. Sometimes we see cranes, sometimes power line towers, but always a certain entanglement that feels wilder than two-by-fours and steel beams. The work imagines our civilized growth as similar to that of a bush or a tree reaching for the sun. Knowing that these types of growth are often mutually exclusive is the basis for the tension in Smith’s work, not the moral of his story. His “portraits” ask us to reimagine ourselves amidst the wildness of our own growth and to see this growth as a part of the natural world. BRETT SMITH (b. 1972 in Durban, South Africa) is a self-taught artist living and working in Atlanta. His works are in numerous private and corporate collections. He has participated in many group shows, including at MOCA GA and Hemphill Fine Art in Washington, D.C. This is his second solo show with Sandler Hudson Gallery.